It is laughable that anyone could have believed Steven Soderbergh when he claimed, before returning last year with Logan Lucky, that he was retiring from movies. He’s plainly addicted to finding new ways to frame the human experience (literally, as his own cinematographer, under the name “Peter Andrews”), sometimes to illuminate, occasionally to misdirect. Would such a dedicated magician set down his cards? Not if there were more serious tricks to play. Like most of his films, his new thriller, Unsane, tests a complicated thesis. Working from a script by Jonathan Bernstein and James Greer, Soderbergh uses various stratagems to keep you guessing about the state of an obviously unstable woman, Sawyer Valentini (Claire Foy), who claims to have a stalker and winds up committed to a mental hospital. Is she telling the scary truth or is she a delusional paranoiac? Back and forth we go, mostly sure of one thing, then another. There’s a definitive answer in the film’s last third — but until then it’s an unnerving switchback ride. The first thing to register is that Foy, the English-born actress who won our hearts and minds as Elizabeth II in The Crown, has purged herself of charm. With an American accent that’s just shy of grating, she’s a financial consultant who’s abrasive with prospective clients and then freezes — she goes utterly blank — when her male boss suggests a trip to a conference that would clearly not be all business. Later, at a bar, she disarms a dating-app acquaintance by assuring him he’ll get lucky that night so long as he pledges never to call her again. Back in her apartment, she flings herself on him — then pulls away, weeping, and locks herself in the bathroom. Soderbergh’s tone is solemn, poker-faced, but he signals Sawyer’s queasy sense of reality with slingshot perspectives and fish-angle lenses. (He claims to have shot the entire film with an iPhone.) The editing is rhythmless, bordering on slack, so that we share her crawly sense of time. Something is way off, and a few of the supporting performers muddle the line (by design?) between nonacting and bad acting. (Her mother — Amy Irving, barely recognizable with short, curly blonde hair and granny spectacles — comes across as an odd bird.) Soderbergh withholds information. Having made the psycho-female noirs The Underneath and Side Effects, he might well see Sawyer as more dangerous to men than they are to her. Or not. During a visit to a psychiatric facility to talk through her fears, Sawyer signs some forms — apparently without reading them — and is promptly taken to a room where a no-nonsense orderly bags her personal possessions and commands her to strip. Is the hospital, as Sawyer concludes, in the habit of locking up innocents until their insurance runs out? Or do the therapists really want to help her? A psychiatrist is maddeningly unreadable. (“To be continued,” he ends their meetings.) Her fellow patients are alternately taunting (an unrecognizable Juno Temple hurling bloody tampons) or suspiciously sympathetic (Jay Pharoah, counseling her to keep her head down). Sawyer fixes on an impassive male orderly (Joshua Leonard) who she claims, in a wild fit, is her old stalker in disguise. The hospital ups her meds. 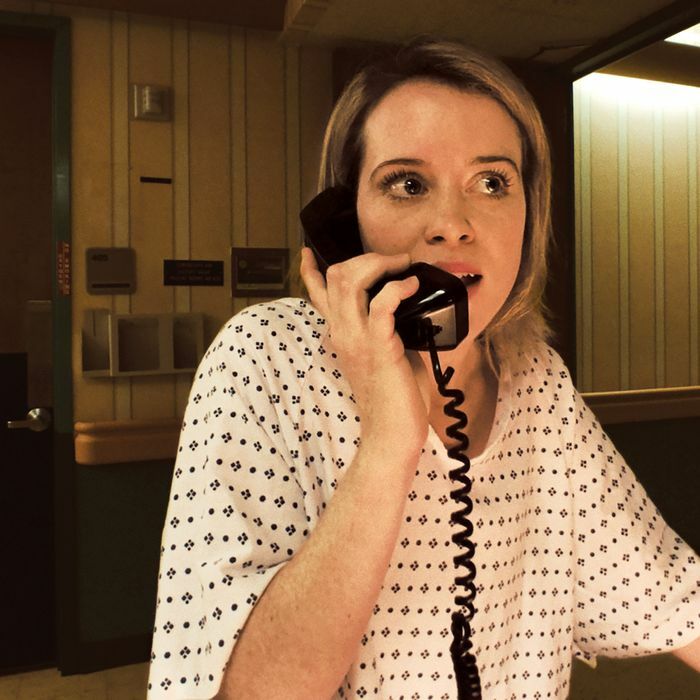 It would unconscionable to say much more — except that, in spite of the somewhat-cheesy climax, I came away admiring Unsane. Whatever Sawyer’s hold on reality turns out to be, Soderbergh and Foy are committed to showing the world through the eyes of a woman whose traumas have left her difficult to understand or like. That resonates now, because even in the era of #MeToo, there’s an expectation that victims will behave rationally — that their bodies won’t retain the memory of their injuries, that they won’t employ defenses that end up alienating the people who want to empathize with them. Sawyer Valentini isn’t an aberration. Her messiness is our tragic legacy.